Miso soup is a classic Japanese soup that is consumed very regularly in that region. Many of the ingredients are thought to play a fundamental role in Japan's low chronic disease rates. This particular soup calls for several ingredients that are most likely unfamiliar to many Westerners. Dishes like these provide a culinary learning opportunity and can help increase the intake of nutrient dense foods. As with any soup, many variations exist which can help ensure a delicious meal and allow for substitutions for more accessible ingredients. The traditional stock used for the soup is a called dashi which is made from mushrooms, sardines or sea kelp. In the United States mushroom stock can be found at health food stores and vegetable stock can be used as a substitute as well. The soup usually calls for sea weed but can be replaced with any leafy green such as spinach or kale. Both of these leafy greens offer equivalent disease fighting micronutrients and are perfectly acceptable alternatives. Miso paste is one of the traditional ingredients that will have to be included in the recipe. Miso is a fermented soy product that is quite salty. It gives the soup a layer of flavor complexity that can not be matched by any other replacement. It comes in red and white versions. Red miso gives more of a robust flavor while the white miso is more delicate. It can be found at a health food store and sometimes at a regular grocery store. Its shelf life is relatively long as the sodium content makes a very hostile environment for pathogenic bacteria. Tofu is the one of the other time-honored ingredients as well. Tofu is also a soy product and a major protein stable in the Japanese diet. In the Western world soy has become somewhat of a controversial food and part of a complicated issue. The common concern related to soy consumption is its high levels of specific isoflavenoids called phytoestrogens. These molecules are biologically active and have similar structure to the estrogen hormone. It is scientifically accepted that over exposure to estrogen can increase risk of certain cancers and some fear induce premature development in girls and unwanted development in males. Much of the confusion originates form studies done on rats which saw increased tumor development with a diet high in isoflavenoids. However, rats metabolize these phytonutrients differently than humans. Rats do serve as a very important model in laboratory research. However, not all observations can be applied to humans, such as this case. In fact, when the consumption of soy and disease rates are compared in humans, it has been found that people with the highest intake of soy have significantly lower rates of all chronic diseases, even breast cancer. As for early or unwanted breast development, the amount of soy that would have to be consumed would not be recommended under any circumstances. Another concern people have is they believe all soy is highly processed and genetically modified. There are definitely many processed soy products on the market and these products should be avoided because they are processed not because they contain soy. It is also true that most soy is genetically modified. However, this soy is used to feed livestock, make bio-diesel, and highly processed foods. Soy products such as tofu, miso, tempeh, soy milk, soy yogurt or edamame are going to be organic. There is no market for GM soy milk for example. Westerners should not be villianizing this protein source. Instead they should be looking for ways to increase their intake of soy products. This plant food provides high quality protein, micronutrients, phytonutrients, fiber (depending on the product), is low in calories and are without question an ally in disease prevention. Asian noodles are typically made of rice and can easily be found in the ethnic section of the grocery store. There are many different kinds and any one can be used. Make sure to add the noodles last and do not let them sit in the soup. They will become soggy as Asian noodles are very delicate. Mushrooms can increase the nutrient and antioxidant concentration. Make the soup your own by making substitutions that will make this meal the most enjoyable an best meets your nutritional needs. 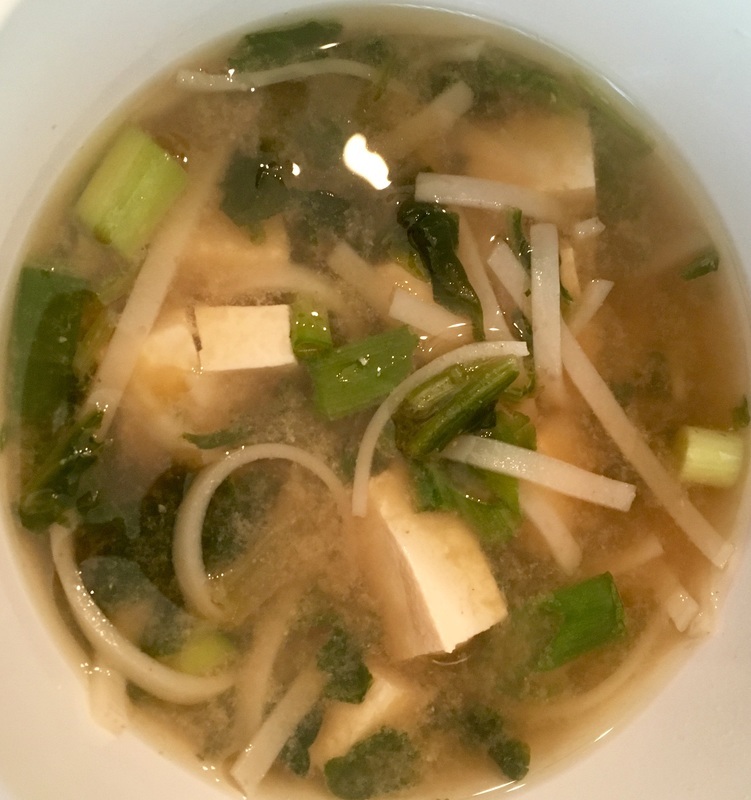 In a large pot or a crock pot combined the stock, water, miso and leafy greens. Cube the soft tofu and add to the pot. Heat the soup on low for up to 4 hours. The longer it can gently heat the more the flavors can marinate together. Once the soup is finished chop and add the scallions. Right before serving cook the noodles in a separate pot according to the packages instructions. Add the rice noodles to each individual serving as needed.